The work necessary to properly - and repeatedly - scrub off the momentum that a 4400 lb, 520 hp behemoth can build up on a racetrack was nothing short of a two-year epic. After almost continuous, track-day-to-track-day experimentation, we've pretty much gotten it all figured out. Rather than focus on all of the fits and starts over time, this page will concentrate on telling the tale of how to do things right the first time, and why you should do each. I spent considerable time looking at a variety of brake upgrade solutions from numerous vendors, including Brembo (both retail kits and an OEM SRT-model take-off from a junkyard near you), SSBC, StopTech, Rotora and others. 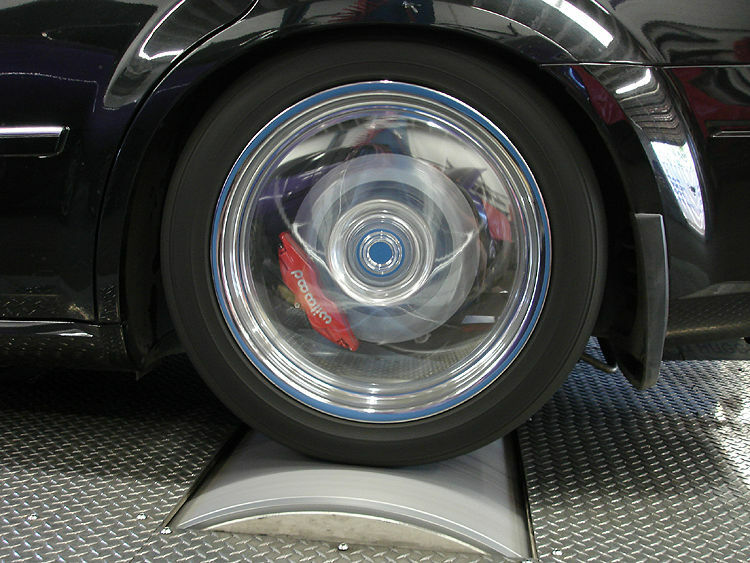 Wilwood was a standout for a variety of reasons, and I went with a solution put together for the LX platform that was developed by Todd Cook at TCE Performance Products. The Wilwood products, in addition to being significantly lower-priced than competing solutions, simply had more pad choices. Not only does Wilwood themselves offer a wide variety of street and trackworthy pads, but their calipers used a stock car-type pad that other vendors, like Porterfield, support as well. At that time, the caliper of choice was the BSL6r, a 6-piston job that fit around an oversized 14'' x 1.25'' directionally vaned two-piece rotor. That caliper is still available, but in the ensuing years since I purchased my setup, Wilwood has released the W6a caliper, which is everything you could want in a 6-piston caliper. Truth be told, the BSL6 is a good caliper, but its being pushed a bit in this very oversized application. By 'pushed a bit', I mean 'pushed a bit if you are into driving world class race tracks that are absolutely murder on brakes'. Laguna Seca is the benchmark when it comes to ''murderous''. More on that later. While TCE sells what they call a Plus 2 kit, which includes the BSL6r and oversized two-piece rotors, I found that those rotors could not survive heavy track use. They were fine on some race tracks, but after as little as one day on Laguna Seca ... they cracked rather nastily (a followup cryo'd set cracked a little less but still cracked). Given that they are a nice part, they aren't cheap. I needed a cheap, disposable rotor, and I found it in the Chrysler parts bin. The SRT rotor is 360mm x 32mm -- just a bit larger than the 14x1.25'' rotors I was already using. They are not two-piece. They are straight-vaned rather than directionally vaned. They weigh in at a whopping 27 lbs, which is a lot more than the Wilwood version... but a brake rotor is a big heat sink, and with peak rotor temperatures measured at 1250 degrees fahrenheit on the track, it was obvious that the SRT engineers had thought through the whole heat sink issue. Best of all, these rotors cost only $90 or so at your local dealer. $70 from a dealer on the internet. Given that, they are virtually a disposable part and I have so far found them to be usable for three to five track days. Given that these large, cheap, high performance rotors are perfectly usable with the Wilwood calipers, you have yourself a full-sized front big brake kit for an astoundingly small entry price. While its a support system and not an actual part of the brake system itself, check out the powered brake ducts I implemented to try and tame the horrendous front temperatures seen on the front rotors while I tried to figure out the optimum pad combination. The rear brakes are once again from Todd and TCE. Again they are Wilwood products. This time its a 4-piston Wilwood Forges Superlite caliper that uses thicker pads of the same backing-plate size as the BSL6. 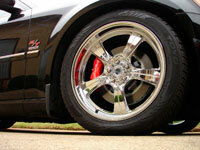 the rotor is an oversized two-piece 13'' x 0.81'' directionally-vaned job with iron parking brake hats. Pretty straightforward stuff. Its worth noting that in almost three years, unlike the fronts, the rear rotors have never worn out, cracked or needed any sort of service or replacement. 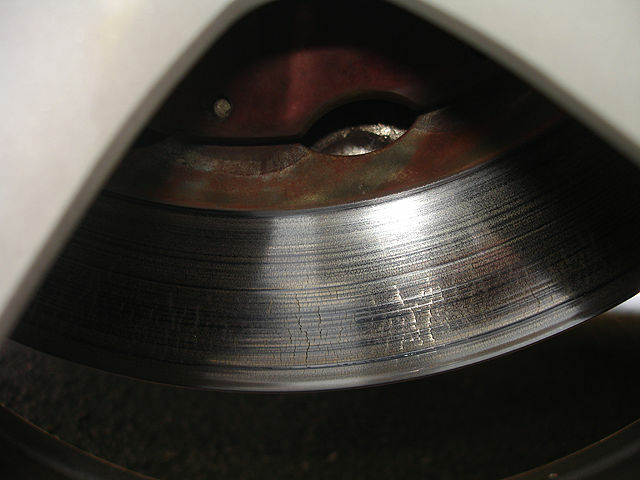 This is despite steadily moving more bias to the rear brakes, culminating in the fitment of the Polymatrix B pads. The saga of discovering the proper pad selection for this platform could fill an entire page and then some. Complicating matters is the fact that, by necessity, biasing the front vs. rear pads is done via pads rather than explicitly through any manual bias valve. Some pad manufacturers do not provide detailed performance graphs like you see above. Graphs don't tell the whole story, but they tell a lot more than many manufacturers, it seems, are willing to reveal. The graph linked below shows the performance for a number of Wilwood street-use pads. Compare them to the track pads above. The BP-20 pad attains a very respectable 0.55 friction coefficient. If a manufacturer tells you only that their pad provides 0.55 friction, have you been told enough? Insist on getting the whole story. The temperature graphs above are the performance characteristics of the Wilwood track-use pads. Not shown are the street pads (they are in the other graph on this page), but suffice it to say I have been through most of them as well. I slowly worked my way up to using the 'H' pads on the front rotors and the 'B' pads on the rear. 'H' pads are the most aggressive pad that is usable on an iron rotor (I'm not yet ready for steel or titanium). Depending on the rotor, if used in a street application they can cause deep scoring even in a short period of time. Luckily, the thick, Bosch-built SRT rotors I now use are only minimally affected by cold street use. Frictionwise, 'B' pads are very nearly as aggressive as 'H' pads. However they are very iron-rotor friendly and, if used cold, they will dust like crazy and squeal a bit but will not damage the rotor. As such, neither are suited for other than track use. On paper, the 'B' pad is significantly over-biased in the rear. I should be using a pad with a lower friction coefficient... say something around 0.50. However, on track, measuring rotor temperatures, the 'B' pad in the rear has been found to work fine, giving no noticeable ABS engagement and creating elevated rear rotor temperatures that are not so hot that rotor life is compromised. In fact, 'B' pads worked so well that a step up to 'H' pads was considered. I decided to quit before I put pads on that might unduly wear what are rather expensive 2-piece rotors. 'B' pads are good enough and I can live with replacing the cheap front rotors. Before the 'B' pads went on the rear brakes, Porterfield R-4 compound pads were used, and they were found to be very workable. Providing a rough 0.50 friction coefficient across the full range of temps encountered during track use, this pad -- which is ordinarily used as an aggressive front pad -- worked very well. But the 'B' pads I tried next worked better. Whats the best low-cost way to upgrade stock brakes for the occasional track day? You can't get where I am with the stock equipment, but you can certainly get most of the way there for a lot less money. Stainless Steel Brake Lines -- Strictly speaking, this is not a performance upgrade. 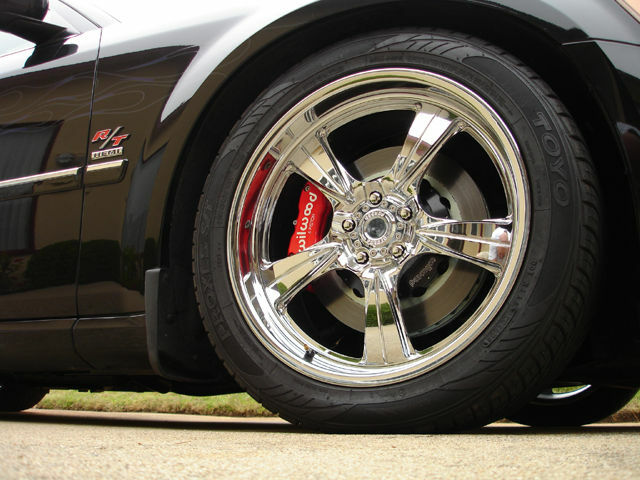 What it upgrades is how the brakes feel to you. As the flexible portion of the brake line will be less prone to expansion, pedal feel will be more firm for a longer period of time. The plusses and minuses of this mod are beyond the scope of this short essay to discuss. Suffice it to say, however, that stainless lines (really... thats braided stainless coverings over a line made most likely of PTFE) are very commonly in upgraded braking systems. Upgraded Fluid -- Many use ATE Super Blue alternating with Super Amber. Its sold cheaply by the liter and has both high wet and dry boiling points, meaning its safer to leave in your brake lines for a much longer period of time. Wilwood 570 fluid has the highest dry boiling point of the low-cost brake fluids that are generally available. Upgraded Pads -- EBC Yellow Stuff is readily available for the stock LX-type brake pad, and is at least a decent compound for track use. Much better would be Porterfield R-4 compound, although it may not be available for the stock LX caliper. Since Porterfield will make custom pads at no extra charge, its a viable - and preferable - option for the adventurer on a budget.